You would have to live deep underground to not have noticed the crazy happenings in society. Almost everyone has been affected in some way or the other by the engulfing mass hysteria that has swept the world. It is easy to believe most of the craziness is politically fuelled; yet it is my belief, the real reason goes deeper than that. The world is not a happy place. The masses are angry and afraid. Dogmatism and cognitive dissonance is rife. Freedom of speech, freedom of thought and individuality are being suppressed. And the energy of hate is skyrocketing. People are being silenced. Most are now too scared to speak out about their true beliefs for the fear of being labelled as sexist, stupid, a conspiracy theorist, a racist, or not politically correct. It certainly feels like all humans are being manipulated to turn on each other. This is not a recent thing. It has been building for a while and will likely continue for many years to come. We live in a world going through the quickening of change. These changes are causing trauma, chaos, emotional pain, depression and more. Although trauma and upheaval may be considered as emotionally damaging, it can lead to growth and spiritual awareness… if we allow it. Trauma is the first step we take across the tempestuous waters of awakening. Pain is a prelude to birth. For some, the initial stages of awakening are seen in random behaviours. Two of these being: denial and blame. In the years to come, you will see this behaviour escalating everywhere. People pointing the finger of blame and convincing themselves their problems lie in the hands of another. Most are so busy avoiding themselves, and instead lashing out at others, that they miss a unique opportunity for transformation. Suffering is part of the ‘wake-up call’. People far and wide are hearing the sirens of the awakening, and call to change, but it is their choice how the transition goes. We can choose to wake-up, evolve and grow, or we can choose to stay in denial. Denial is the ‘seemingly’ comfortable ‘safe’ passage. At least for a while. But it really just prolongs discomfort. We can’t ignore evolution forever. If we try, things eventually become so bad that we are forced to change. All humans are presently being fed fuel to stoke up their raging emotions of anger, bitterness and hate. If we engage them, these types of emotions keep us trapped in mental conflict and away from finding peace and harmony. Evil begets evil. Hate breeds hate. Anger feeds anger. Fear fuels fear. The more of this type of energy people put out into the world the more it grows. We all have light and darkness within; both love and hate. Whichever we choose to give the most attention to will be the force that guides our feelings, thoughts and choices. Choose wisely. We are the creators of our own reality. It is clear there are some seriously strange things happening in the world. (If you’ve read anything about the Mandela Effect you’ll know what I mean). There is a lot of positive change happening and many truths are being revealed; but we are also being distracted to prevent us from discovering our own power. Distraction is a powerful tool. When our mind is preoccupied with all the wrongs in the world, we don’t see what is right. And we don’t notice the powerful positive and uplifting energy that is all around us. We are at the crossroads of change. Being a crossroads means we have a choice of which direction to take. We can choose the path of denial and despair or the one of love and gratitude. That choice is often determined by where we place our focus. You would think it’s a no brainer to choose the positive love energy. But the more people who focus and send out the hate/fear energy the more this builds and the harder it is not to become embroiled in. For the Empaths, this low-level energy, that has swept the globe, is agonizing to experience. But it can also be perversely alluring; drawing us in without our realizing. I too have been lured into engaging the distressing and emotionally provoking news, designed to distract, divide and enrage. And yes, I get wound up by it all. I keep having to remind myself to unplug and stay switched off from it. I know I am wasting my time and precious energy by allowing myself to be distracted. Some might argue that we have a duty to stay informed, we should fight for our rights and silence is consent. And, as much as I may agree, most of what we are being fed is shameful propaganda, which does nothing but feed our darkest emotions and pains the soul. When we focus on the incredible force of gratitude and love, it is a game changer. We then see more and more positive come into our life through the law of attraction. Choosing to stay unplugged is the best form of protection at this time. Especially if you are badly affected by all the hysterical energy. Stay away from the media: Online news, social media and televised news reports can lure you into negative thinking, frustration and anger. Avoid politics: Don’t get involved in dogmatic discussions and avoid those who seem to thrive when politically venting. Steer clear of large groups of people or protests: Mass hysteria is contagious and drags everyone in, even those with the best intentions. Pursue your passions: Do what you love and be creative as often as you can (your own form of distraction). 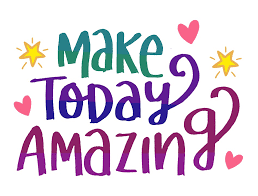 Express gratitude every day throughout the day: Be grateful for anything you can. A delicious meal, a good book or film, or just the traffic lights being on green. Keep pumping this positive energy out. Keep control of the mind: Meditate or do moving meditations like yoga, Thai-chi or dance. Get outdoors: Spend as much time in nature as possible and bask in natural sunlight. Pain serves us in mysterious ways. We eventually come to a point when we understand why we endured all we have, and we recognize how our pain shaped and changed us for the better. But we don’t need to keep experiencing it over and over. We have a choice. Now is the time to start shaping your new reality by unplugging from the old. To learn how to empower yourself during these trying times, click on the link or the picture opposite. Have you happened to notice recently that when you are in a really good place, maybe doing something that makes you feel happy and uplifted, you find yourself thrown off centre and being pulled down into a darker place? You may receive a phone call, text or email off one of those people in your life who act as a trauma trigger, or a family member, who always manages to push your buttons, shows up. Do you think this is by chance? We live in an ever-changing world. Changes are happening around us every day! But it is when there is a huge energy shift that an Empath may find themselves affected. Rewiring and rebooting are words used a lot within ascension or new age circles as an expression of how we are affected by energy shifts, and, in these times, I feel those two words could not be more appropriate. On some days intense energy shifts may lift us up or bring us crashing down. They often cause anger, frustration and depression; or incredible joy. This fizzy-type of energy cannot be mistaken, it pretty much leaves you feeling like you have been charged up with electricity. And although you may feel mentally or physically tired, this buzzing energy can keep you awake at night. Poor memory recall and a fuzzy head seems to be the norm in recent years; but when there’s a shift do not be surprised if you feel more scatty than normal. It may seem like I’m stating the obvious here, because for Empaths it is normal to feel strong emotions, yet these emotions/sensations are not like the normal ones we experience. They come out of nowhere and range from anger to blissful happiness. You may find yourself waking up in a bad mood, with no reason, or little things that would not normally bother you suddenly have you riled. Then you may find yourself feeling happier than you ever have. We are also getting the backlash of others’ strong emotions. Many people are now being activated or affected, as I have said many times before, it can be very easy to lay claim to another’s emotions and build them into our own life-story. You may have previously been able to put up with another’s self-centred ways, but now find yourself quickly backing away from dramas. You could have come to a point where you will no longer put up with bad behaviour, nor allow others to pull you down. You have decided enough is enough! You have very likely been on this path for many years; and during this time you have dealt with your emotional wounds, whilst others around you looked on or had no idea what you were enduring. In recent times, those others are now going through these changes. It is their turn to process and deal with their emotional wounds. So, if you find yourself walking away or distancing yourself from family or lifelong friends’ dramas, selfish behaviour or other, it is your internal knowing, stopping you from getting involved. If you find past issues stirred up, that you had long since forgotten or already dealt with, it is very likely because they have been triggered within a friend or family member, as part of the energetic shifts, and you are picking up on them. This may have further pushed you away. 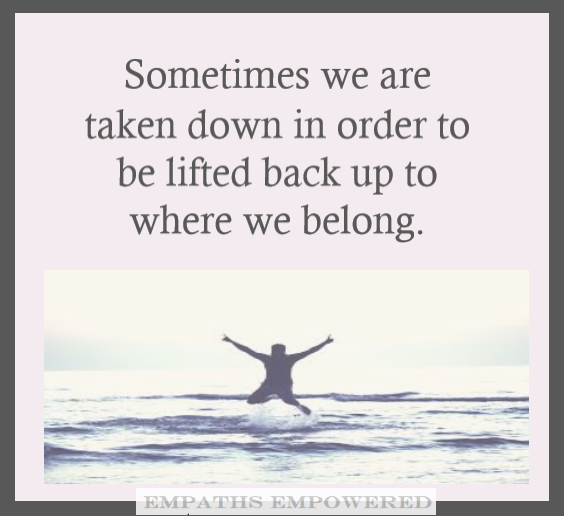 For Empaths, walking away from those in emotional turmoil is not something that comes naturally. It may seem somewhat cruel or aggressive. But you are not being cruel by not engaging in ‘their stuff’, it is simply not yours to deal with. They have to do it for themselves. This is very much a DIY process! Another sign of energy shifts is wanting to change one’s lifestyle. Like giving up people, foods, drinks and habits that do not promote all-round health, happiness and wellbeing. 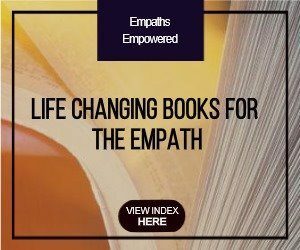 Most Empaths make gradual changes to their lifestyle over the ‘awakening years’, but when there’s been a shift all the ‘health’ pieces start clicking together. You find a diet or exercise plan that works to heal your body, mind and spirit, and you want to stick with it. You may also suddenly feel very ready to make big changes: in your career, social life or habitat. You find yourself doing things you have wanted to do, but put off for years. It’s as though the past self-doubts that previously held us back, no longer have the same hold. But we also know we’ve got to meet our new life half-way and that means stepping out into the world to bring it forth. These are just some of the ways you may have experienced the shifts and I’m sure there will be many others too, not listed here. But one thing is for sure: if we are to truly evolve in life we cannot have the old dramas (people, jobs, lifestyles) dragging us back down. Energy shifts help us evolve, and although they may be uncomfortable, they help take us to all the right places. An interesting article I came across on www.shiftfrequency.com and a must read. Carlos Barrios, Mayan elder and Ajq’ij is a ceremonial priest and spiritual guide of the Eagle Clan. Carlos initiated an investigation into the different Mayan calendars circulating. Carlos along with his brother Gerardo studied with many teachers and interviewed nearly 600 traditional Mayan elders to widen their scope of knowledge.